At the turn of the century, a little-known French Consul in China, Auguste François, made headlines by saving a handful of French citizens during the Boxer uprising. In China from 1896 to 1905, he witnessed some of the greatest events of the time. François was an avid photographer, and with one of the first movie cameras, lent to him by the famous Lumière brothers, he documented the historic events and everyday life he saw around him. With the zeal of an amateur filmmaker and relatively free-access in the cities he was posted to, Lungchou and Yunnan-fou (today Kumming), François filmed sketches of street-side life, from the vendors and grocers selling their wares, to the local ear-cleaners and flea-pickers - professionals famous for their dexterity. While on official assignments François explored the outlying countryside, making long, epic trips to other areas of the country. 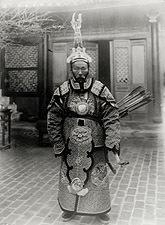 On one such trip to Tibet he found himself caught in the midst of a violent revolt by the indigenous Yi against the Chinese (in the film are photographs he took of the Yi). Culled from François' letters, diary entries, and notes, and with a wealth of rare archival photographs and films - including the first films shot in China - THROUGH THE CONSUL'S EYE chronicles the experiences of this aristocratic diplomat, who left us a remarkable portrait of China on the brink of a new age. Two-part documentary tells the history of China in the 20th Century - entirely with original archives and motion pictures.